James "Buddy" Thompson at the Frazier Museum. 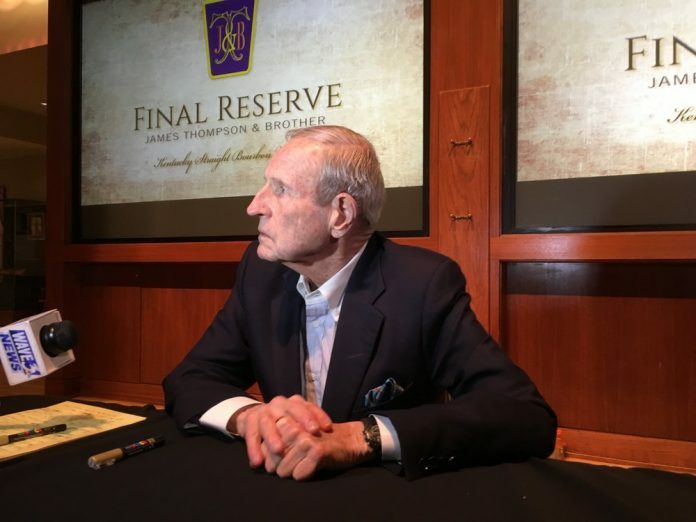 James “Buddy” Thompson, known in the whiskey world for bottling the world’s longest-aged bourbon, has died at 87. Born in 1931 in Louisville, Kentucky, Thompson wore an astounding number of hats in his life. He attended the U.S. Naval Academy, eventually joining the Marine Corp., and graduated from Yale University in 1954, where he was a member of the famous Whiffenpoofs a cappella group. He had a passion for aeronautics, and loved hot air ballooning and building his own aircraft, with varying degrees of success. Thompson was known as a leader in the Louisville community, directing the Louisville Airport Authority, running for Congress in 1966, and being appointed state auditor in 1969. He also had deep ties to the world of whiskey, and took the reins as President of his family’s business, Glenmore Distilleries, after the untimely passing of his brother in 1974. Thompson Brothers Final Reserve 45-Year Bourbon. 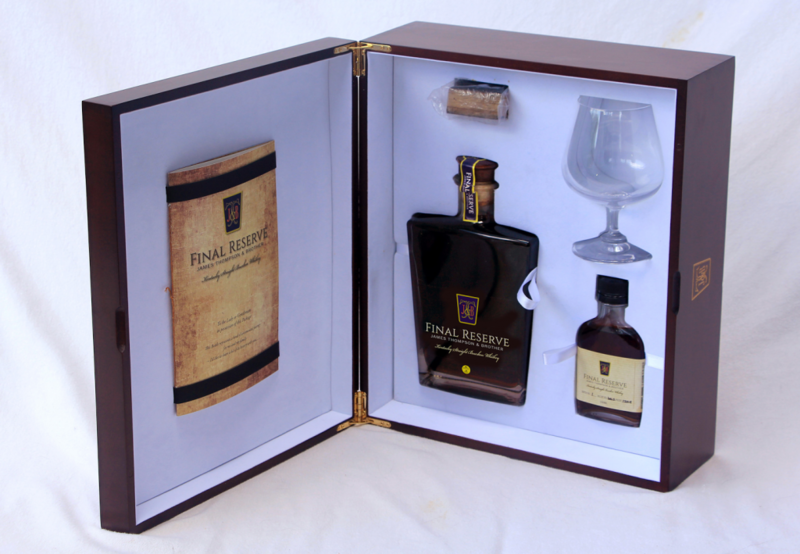 His last project, James Thompson & Brother Final Reserve 45-Year Kentucky Straight Bourbon Whiskey, began back in 1973. Thompson purchased barrels from Louisville’s Yellowstone Distillery that he intended to bottle at the millennium. 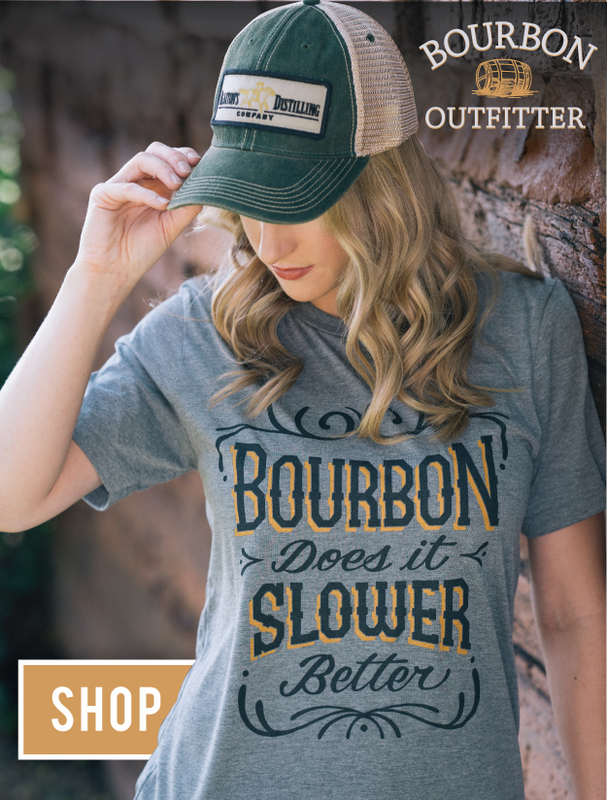 The decades that followed, however, were not good to the bourbon business. Thompson kept an eye on his barrels regardless, making special trips to taste them as the years ran on. After 45 years, and a conversation with a friend involved with The Congressional Medal of Honor Foundation, he finally decided to bottle his barrels to benefit the foundation. The first release of James Thompson & Brother Final Reserve in 2018 raised over $400,000 for the foundation, as well as $45,000 more for the Frazier History Museum, where the release event was held. These were far from the only charities lucky enough to count Thompson as a benefactor. Always a philanthropist, he sat on the board of the Regional Mental Health Agency, the Regional Cancer Center, the Airport Authority, and Citizens Fidelity Bank. He was also involved with the United Way, the Louisville Cancer Center, the Fund for the Arts, Actors Theatre of Louisville, the Speed Museum, and more. “Buddy was a remarkable man whom lived an extraordinary life. His accomplishments and philanthropy are at the very top. It was a great honor getting to meet him. His legacy will live on forever,” notes Seth Thompson, Publisher and Co-Founder at The Bourbon Review. Thompson is survived by his wife Sandy, his four children, and three grandchildren. In lieu of flowers, his family is asking that those who knew Buddy consider a donation to The Congressional Medal of Honor Foundation.